So why do I need to smoke bees? How does the bee smoker work? The smoke that the bee smoker emits is used to calm the honey bees, preventing them from getting too hostile towards the beekeeper. Bees can be dangerous insects if not handled with care so extra precaution must be taken. With the bee smoker in hand, the beekeeper can perform frequent routine hive inspection without fear of being viciously attacked by the bees. Using the bee smoker is also safer for the bees compared to other traditional methods, like the use of fire that may kill them and could possibly drive them away from the hive permanently. Other studies also suggest that beekeepers that use smokers don’t scare away the bees as the smoke puts the them into a cooperative mood. Another advantage of using the smoker is that bees won’t sting, and since they won’t sting, their chances of dying are reduced. Bees usually detect the presence of people near their hives by way of a smell that triggers a reactionary instinct, which gets them ready to move from the hive. They get ready to leave by eating the nectar and honey so they have enough supplies as they look to a find new place to settle in. In that state of confusion, the bees they also concentrate on securing the queen. However, a safe place is also created for the beekeeper to work easily, be it honey harvesting, or simply doing routine bee hive inspection. Even though there is no guarantee that a beekeeper will not get stung, the likelihood is greatly reduced. What the bee smoker does is to break up the pheromone signals that the bees use to communicate with each other when they notice a hive intrusion. Under normal circumstances, if the hive is opened without the bee smoker, the worker bees after sensing the intrusion, will inform the other bees by use of pheromones to launch attacks. The bee smoker works by concealing their pheromones, thus hampering their method of communication. There is also the case where if a bee stings an ‘enemy’, it sends the same pheromones to other bees to come and attack, but when a smoker is used, it confuses the other bees. What this essentially means is that not many bees will be lost due to stinging. The bee smoker can also be used on yourself, to conceal your human scent so that the bees will be less likely to get agitated as you approach the hive. The fuel types each have their unique characteristics, in that some will burn out quicker than others, and some won’t smoke as much. I highly recommend dried pine due to its sap content that makes it have a rich and smoky fire. Once you have lit the smoker and its fire is burning you will then close the lid. Closing of the lid causes a restriction of the air flow making the fire smolder, thus creating heavy smoke. 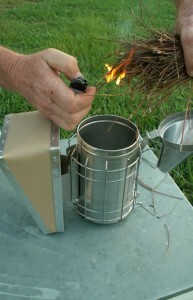 You will then squeeze the bellows and air will be forced out of the nozzle hole feeding the fire. When the bellows are opened, air is sucked back into them. It is important to be careful with a lit hot smoker as it gets too hot in a short time and therefore accidental burn can occur. It’s highly recommended to wear beekeeping gloves. Once you are done with the bee smoker, put out the fire first and then empty it. As you use the smoker on the bees, you are to keep in mind the fact that you are not going out there to fight them. As you open the entrance of the hive you can just give a few puffs to allow you get ahead with your business there. This intrusion will be enough to agitate the bees but it should not scare you because the smoke will help you do your work there safely. You are to release the puffs in intervals of 5 minutes to inform the bees that there is still the fire danger around. You are release the puffs slowly and hold it in about 8 to 10 inches away from the hive. 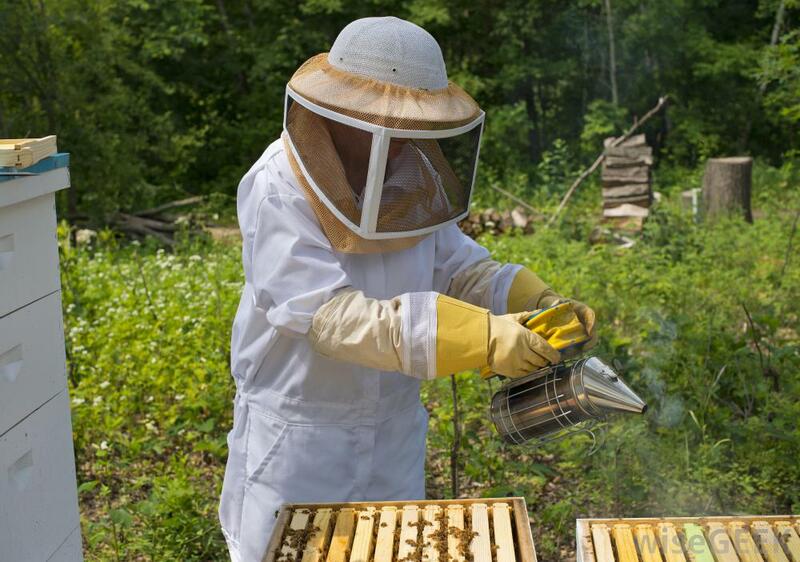 Additionally, for maximum safety, you are to always wear a beekeeper suit when checking on the hive. The bee smoker is indeed a very significant beekeeping tool, particularly where hive inspection and honey harvesting is involved. Learning about bee communication as discussed above is vital too because it helps understand how the bee smoker works by masking pheromones that bees use to communicate with each other. You must also choose the right kind of bee smoker fuel that will not harm the bees. Check out the Goodland Bee Supply Stainless Steel Bee Hive Smoker. View the Mann Lake HD540 Stainless Steel Smoker. Check out the Agralogix Bee Smoker with Oxygenator Fuel Tank Insert. View our rankings of the best bee smokers.